American History in Video - 5,000+ titles. The collection allows students and researchers to analyze historical events, and their presentation over time, through commercial and governmental newsreels, archival footage, public affairs footage, and important documentaries. Art and Architecture in Video - 500+ hours of documentaries and interviews illustrating the theory and practice of a variety of art forms. Counseling and Therapy in Video, Volume I & II - 700+ hours of training videos, reenactments, and footage of actual therapy sessions conducted by renowned counselors, psychiatrists, psychologists, and social workers. Various therapeutic methods, diagnoses, and cultural groups are featured. Ethnographic Video - 1100+ videos covering human behavior the world over. Essential for the study of anthropology, as well as the areas of politics, economics, history, psychology, environmental studies, religion, area studies, linguistics, and geography. Filmakers Library Online - 1000+ documentaries on race and gender studies, human rights, globalization and global studies, multiculturalism, international relations, criminal justice, the environment, bioethics, health, political science and current events, psychology, arts, and literature. LGBT Studies in Video - 250+ videos on LGBT political, cultural, and social movements throughout the 20th Century and into the present day. Nursing Education in Video - 300+ videos created specifically for the education and training of nurses, nursing assistants, and other healthcare workers. Theatre in Video - 250+ definitive performances of the world's leading plays, together with more than 100 film documentaries. Entire videos, playlists, or clips can be embedded or linked within a course and/or web page. 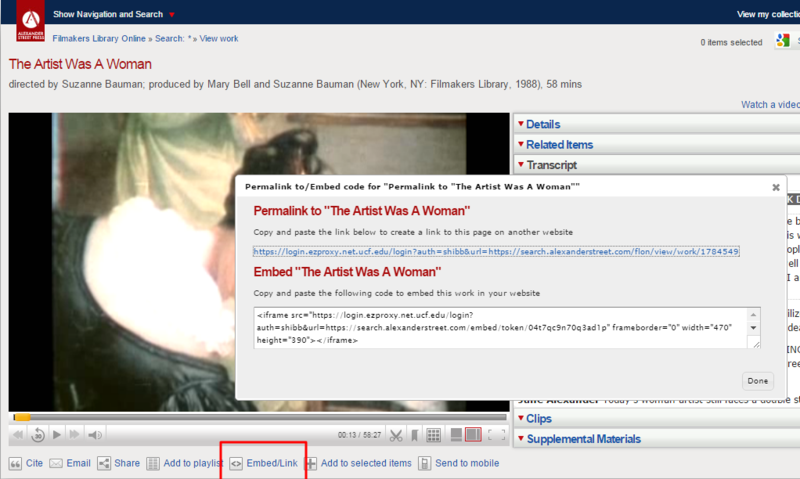 While viewing a video or clip locate the Embed/Link icon. After clicking the Embed/Link icon, you can choose to 'Copy Link' or copy the embed code to place the video in Webcourses. Since students are already logged into Webcourses they will have immediate access to the videos from on and off campus!